It’s a weird old place Ásbrú. 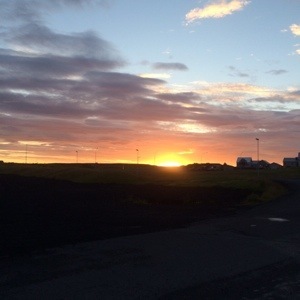 It’s a former NATO base, and the ghosts of its past use are on every corner—the hangars, the barracks, the unmanned checkpoint as you enter—and it’s oddly located being too far to walk from Keflavík, and yet close enough to be handy. It’s a complex mix of the abandoned and the new, mainly celebrated by painting buildings in bright colors. Ásbrú is now home to ATP which has set up base in a clutch of buildings around a hangar now known as Atlantic Studios for the second year running. Last year, as everyone will tell you, was a huge success save for Nick Cave taking an unscheduled tumble from the stage and ending up in hospital. It rained all day, and there has been a steady stream of hipsters arriving completely unprepared for the vagaries of an Icelandic summer. Damp beards and soggy satchels are everywhere, and I feel sorry for those that are camping. It’s hardly Benicassim, is it? Thursday also has a strange feeling to it—the timetable isn’t as full as Friday or Saturday, and I’m thinking that most Icelanders will be leaving it until Friday to really get the party started. One stage—Andrews Theater—only has two bands on tonight, and the main stage, just four. It feels like a warm up before the main event, a rehearsal or practice even. That said, ATP has a welcoming, homely air to it. It might be the coffee and kleinur on sale at the back of the main hall, the sofas in the ‘cinema,’ the handmade signs advertising ‘book bingo’ or the slight lack of organization (signage?) but it feels good. Low are the first band on stage, and look startled to be there. It’s a melancholic start to proceedings, and with the still persistent rain, we could have done with something a little more lively. To dry out, I dash to the cinema—it’s actually a classroom with sofas, and warm radiators—to watch The Deep. The films are curated by Portishead, but this one is thoroughly Icelandic, and follows the true story of a stricken fishing vessel from the Westman Islands and its sole survivor. It’s scored by Ben Frost, who is playing at the festival tomorrow. I make a note to see him. Swans have pulled out, but have been replaced by Spiritualized Acoustic Mainstream in the Andrews Theater. It’s a good swap. Spiritualized Acoustic Mainstream is basically Jason Pierce recreating Spiritualized’s quasi-hymns with the help of amiina and vocalists. It works well, especially with the soaring, swooping strings from the girls and the extra vocal strength backing up Pierces’ plaintive voice. Back in Atlantic Studios, the ridiculously named Kurt Vile and The Violators are on stage. Kurt alternates between moments of talent—usually on his own, or with his band in country-tinged mode—to slices of self indulgent rock, which is a real shame as he tends to lose the audience during such jaunts. Nevertheless, Kurt manages to plug the gap until tonight’s headliners. Mogwai, hailing from Glasgow are no strangers to ATP or Iceland, and they arrive with a wall of sound. Opening with ‘How to be a Werewolf,’ they are loud, intense and moving. With eight albums under their belt, and fresh from touring Europe, Mogwai are on top form and deliver a confident set. Stuart Braithwaite thanks the crowd with both “Takk” and “Cheers’” It feels like a proper band has arrived at last. I leave happy, and head back out into the rain. Mammút are the wakeup call we needed. Enthusiasm abounds, and they make enough noise to set off car alarms and shake the rain drops out of my clothing. 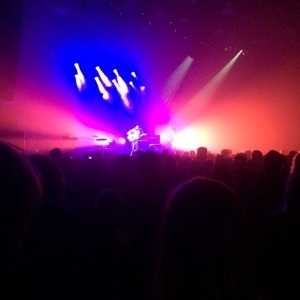 Their songs are short and sweet, and probably better suited to Reykjavik’s late nights than this early slot. It works, though, and they draw a hefty crowd. Extra points for glowing clothing. How many festivals have a van serving lobster tails? Or one serving kjötsúpa (Icelandic meat soup) for that matter? 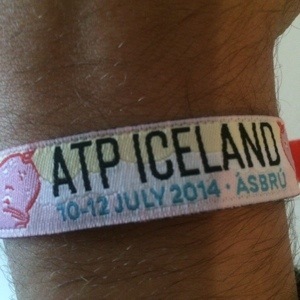 ATP does, although I’m starting off with a burger from Hamborgarabúllan, which has taken time out from conquering the world to be here tonight. It’s a far cry from the usual festival fare. I’m all for it. Pascal Pinon is in Andrews Theater. Now with an extended line up—Jófríður explains that the guitarist was found in the street, the bass guitarist is a housemate—to flesh out their folky, whimsical songs. It sounds as if they’ve been given a new lease of life. Old favorites such as ‘Ekki Vanmeta’ and ‘Bloom’ are still here, but the new stuff sounds much more mature, and I can’t wait to hear more of it. New found confidence in place, they finish with the new ‘White Sun,’ which sounds sublime. Surprise of the night came from Low Roar. Previously just Ryan Katazija and his guitar, he has gained a stage presence and following to match. Aided by Mike Lindsay from English folk band Tunng, and Silla presumably borrowed from múm, Low Roar are now something to behold. They fill the theater with their lush, deep sound revolving around Ryan’s fragile songs but are clearly not afraid of electronics, looping or occasionally breaking into dance. Excellent stuff. Speaking of dance, Samaris are up next. Despite the best efforts of Jófríður (back again—busy girl! ), for some reason dressed in unseasonal tinsel, the majority of the performance fails to connect, probably as we were all seated and this is primarily music to dance to. By the end of the set, they are hitting their stride, though, and even the maudlin sounds of the clarinet can’t bring things down. Somebody should have put Samaris in Atlantic Studios, where they could have got the crowd going a little more easily. And it has stopped raining. Starting with the impressively monikered Forest Swords, actually Matthew Barnes from The Wirral and his bassist pal, is a hell of a way to start. Despite bass that vibrated my corneas, Forest Swords layered sounds, twisted and weaved over electronic beats sounded terrifying and intense. Thor’s Stone sounded awesome. I catch some of Fufanu over in Andrews Theater, but the young Icelanders are not cutting it, with too much going on, including techno squeaking, an over-active drummer and an unnecessary trumpet. Less is sometimes more. Sin Fang seem a little lost in the expansive hangar, which is a real pity, as I’m a fan of anything Sindri turns his hand to, not least his latest album, Flowers. He doesn’t seem to know where to put himself, and the crowd responds accordingly. I return to Andrews Theater for Kría Brekkan. Quite possibly the quirkiest act I’ve seen all weekend, Kristín Anna sits alone at her piano like a rare exotic bird, constantly tweaking bits of gadgetry, whilst delivering childlike vocals in a seemingly endless stream of consciousness. It’s not without charm, but can feel a bit like you are invading her personal space. For A Minor Reflection have been around for a while now, and have a back catalogue to draw upon. They do, and the trademarks gained by touring with Sigur Rós make for a tight, thrilling show with impressive visuals to go with their post-rock. A mid set technical failure threatened to upstage the whole thing, but actually just caused them to play with renewed energy. The last track, untitled and new was as blistering hot as the molten lava on the screens behind them. I leave ATP confused. The venue is an odd choice, and I’m not 100 percent sure it works. It’s location is far from ideal, and at times, it still feels and looks like the abandoned air base that it is. Thursday felt a little flat, whilst yesterday was buzzing. The music however has been hard to beat, with winning sets from Mogwai, Low Roar, Spiritualized Acoustic Mainline, For a Minor Reflection, I Break Horses and the mighty Portishead. 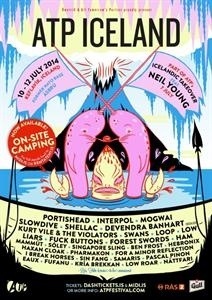 I took a walk in downtown Reykjavík earlier today; all I heard was talk of Portishead and ATP. That, I think, is a triumph. Previously published on Iceland Review online.